The SOA Watch Convergence at the Border—also the 27th Annual SOAW Gathering—in Nogales, AZ/Sonora October 7 to 10, was a great success in showing solidarity with those at the border and drawing attention to the militarization there that has such a devastating effect resulting from the economic and political policies being implemented at the border. The second part of our inside look at the SOA Watch’s first ever Convergence on the Border, October 7-10, 2016. Hundreds of activists gathered at the US/Mexico border to bring attention to the dire situation of immigration in our country and to witness with love and solidarity. 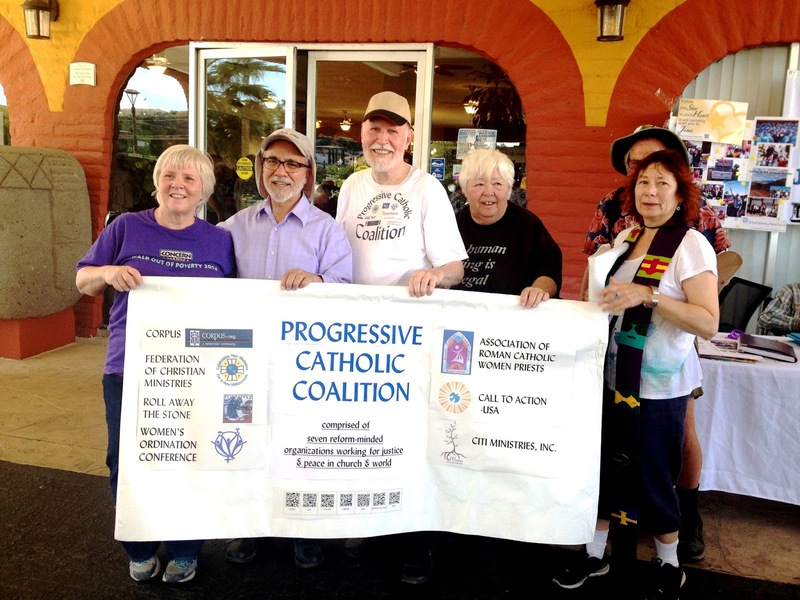 On Saturday evening, October 8th an Interfaith Service composed by a working group that included three PCC representatives was held at the Border. Included in the service were Indigenous rites and participation of speakers from Jewish, Muslim and Christian traditions, with the PCC representing Catholic input. Thanks to our PCC Sponsoring organizations and their representatives Kay, Sophie, Janice, Silvia, Rosa (and Mary and Nick DelRio of CORPUS) for their participation in making the PCC's valuable message for justice! "The role of citizens in our Democracy does not end with your vote. "Why Has the Pope Said No to Women Priests" CNN, What's up with Commission to Study Women Deacons? "One, he subscribes to the Catholic Church's long tradition of male priesthood because Jesus chose men as his apostles and because of their theological understanding that a priest, "acts in the person of Christ," so must be male. This is what Francis was reaffirming by quoting St. John Paul II." 1.The Risen Christ chose Mary of Magdala to be the apostle to the apostles. Christianity is based on a belief in the resurrection of Christ According to all four Gospels, Mary of Magdala was the first to encounter the Risen Christ who called her to go and tell the good news -the job description of an apostle. Thus, there were more than 12 apostles. In addition, St. Paul refers to Junia, a woman, in Romans 16:7 as an outstanding apostle and mentor. 2. Galatians 3:28 reminds us that baptism makes us equal images of Christ. There is "neither male or female in Christ"
3. As members of the Body of Christ, we are called and empowered to act in the person of Christ. 4. 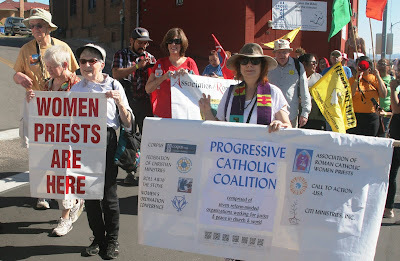 To argue that a priest must be male to act in the person of Christ is sexist and justifies discrimination against women in the church and society. It violates women's soul integrity as images of God. 5. Pope Francis's statement puzzles me because he has commissioned a Commission to study women deacons. According to scholars there were thousands of women deacons in the early centuries of Christianity. If he opens door to women deacons, women priests are logically the next step. So my question is what's up, Pope Francis? ..."So, I want to ask Francis: Don't you get it? That Reformation you celebrated is known for being open to change over time, over centuries — and that includes an openness to women pastors, priests, ministers, bishops and even archbishops. I like the idea of a feminist 95 Thesis! If we hurry, we can put them on the Door of Mercy in this Holy Year. it is the hierarchy who needs to repent of centuries of sexism for their failures to treat women as equals. They need to reform the clerical model of all-male priesthood that is out of touch with Catholics today. For three years, I have dreamed of creating a retreat to celebrate; The Fall Triduum. I discovered the idea from a blog entry by Contemplative Teacher, Cynthia Bourgeault. I have wanted to share this ever since. I brought the idea to my Heart of Compassion Pastoral Team and they graciously helped me to make it happen. The following is the bounty of our collective genius! Please enjoy and have a Blessed Feast of All Hallows’! 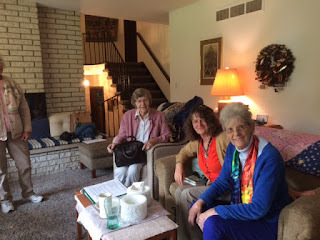 Thank you especially to: Michele Birch-Conery ARCWP, Sydney Condray ARCWP and Marianne Bernard from Michigan Call to Action. Our Beloved God blessed our mini-retreat with a beautiful afternoon for October 29th in Michigan! The Mini-retreat went from 1:00 to 4:30 in the afternoon. 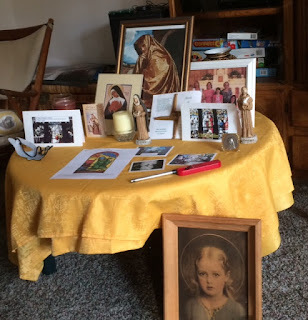 Everyone was asked to bring; a potluck dish that a loved-one, now passed, loved to eat and a depiction of a favorite saint as well as a picture of a loved-one that they would like to remember. 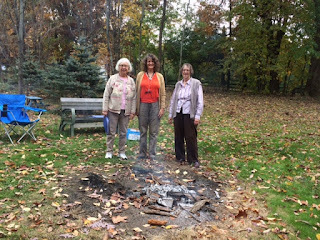 There were six parts to the retreat: The Gathering at The Sacred Fire, Celebrating The Eve of All Hallows, Celebrating the Eve of All Saints, Celebrating All Souls’ Day, With Thanksgiving Celebrating Eucharist and finally sharing potluck supper. 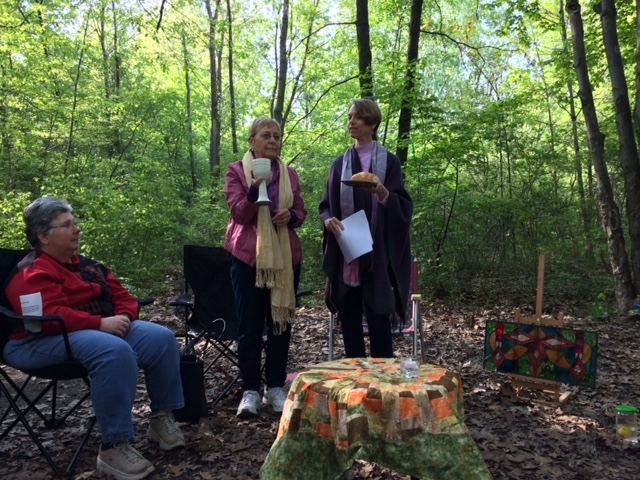 The First part of the retreat began outdoors with a prayer service around a bon-fire. Welcome to Our Celebration of The Fall Triduum. This is a special and sacred time, celebrated by my many cultures. We are halfway between the Fall Equinox and The Winter Solstice. In the Christian Liturgical tradition, this time is remembered as the three-day festival of All Hallows’ Eve, All Saints’ Day and All Souls’ Day. Especially, in Celtic and Mexican Christian Cultures, these days are a liminal and threshold time where the veil between ourselves and those who have gone before us is very thin. So, I invite you, into this mysterious time. 1. Our Abba- Mother, Hallowed be your name. We know you are with us, This Hallows’ Tide and always. 2. We are asking for the Presence of our holy companions, as we walk together on our spiritual journeys. 3. We cannot go forward without your Grace. You know our need before we see it. 4. Help us to surrender what we carry within us that is no longer useful. 5. Go forward with us as we embrace a realization event. Let us find anew the empowerment of our true self. 6. Commission us to act for the good of ourselves and others. Pour out your blessings as we welcome the mystery of this sacred time. After 5 minutes of silence to savor the fire, I invited everyone to gather at the door to our gracious hostess’ house. Before entering the house, I asked people to pause to let go of the cares for the day that they brought with them and to experience crossing the threshold to this “thin-space” and “luminal-time” of The Fall Triduum. The Second Part was, to honor The Eve of All Hallows’, we were invited to do; “profound inner work: to face our shadows and deep fears.” I created a centerpiece of Halloween Masks and each person was given a private journal to do this inner work. Leader 1: The three readings for today’s liturgy, represent each day of the Fall Triduum. The first reading recognizes the Eve of all Hallows. During this time we will look for the false, small or illusory self, who lives, in each of us. This false self is the one who hides behind the mask. There are some masks that we are ready to discard. Others, need to be kept. 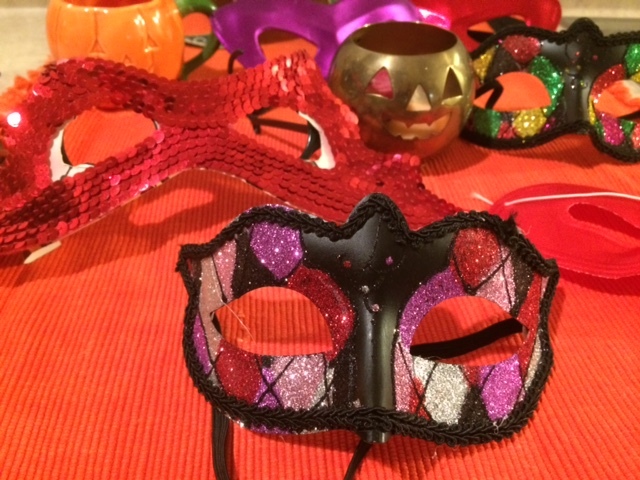 I invite you to use this exercise for the masks you feel ready to discard. I invite you to wear your mask as we read this reading. Reader 2: A Reading from Thomas Merton's description of his conversion at fourth and Walnut. "At the center of our being is the point of nothingness which is untouched by sin and by illusion. This is a point of pure truth. It is a point or spark which belongs entirely to God. It is never at our disposal. From this point God disposes of our lives. A Divine Act which is inaccessible to the fantasies of our own mind or the brutalities of our own will. It is like a pure diamond, blazing with the invisible light of heaven. It is in everybody. And if we could see it we would see these billions of points of light coming together in the face and blaze of a sun that would make all the darkness and cruelty of life banish completely. I have no program for this seeing. It is only given. But the gate of heaven is everywhere. " 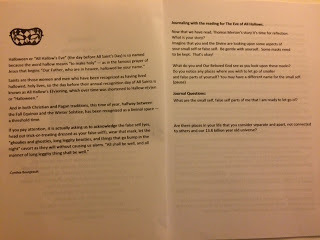 Journaling with the reading for The Eve of All Hallows. Now that we have read, Thomas Merton’s story it’s time for reflection. What is your story? Imagine that you and the Divine are looking upon some aspects of your small self or false self. What are the small self, false self ( ___________: Your way of naming this) parts of me that I am ready to let go of? After 13 minutes of private journaling work. 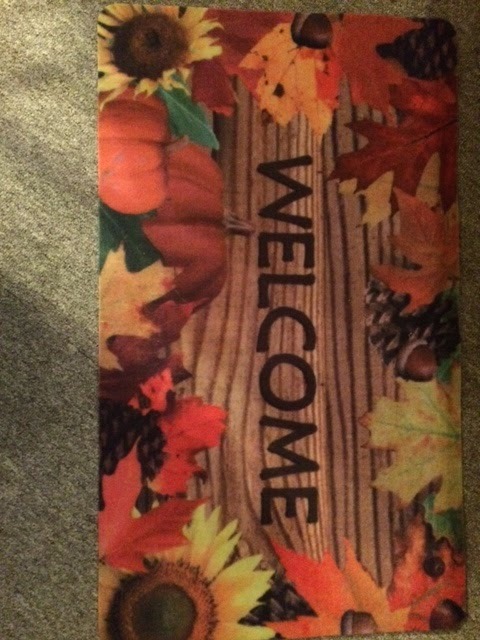 I asked people to return to our living-room gathering place. I let them know 2 minutes before I wanted them to gather. While our retreatants were journaling for All Hallows’ Tide, I changed our centerpiece to display, All Saints’ Day. The display included the statues and other depictions that people had brought. This was our; All Saints’ Table. The Third Part was to honor, The Feast of All Saints. When they returned from journaling, I gave people time to share what they had brought. I also had a mirror, I invited them to take a moment to gaze upon themselves the way that God sees them. Leader: Before you take your turn to read your beatitude, think of a saint or someone deserving to be a saint, that you would like to have companion with you on your Journey. Let us pause to think of your saint. (Pause)… When you read your beatitude say your name with the word, "Saint" before it. Then say "and" the name of the Saint who is your companion. Please remove your mask before you read your beatitude. I will go first for example. Karen is Reader 3: Saint Karen & Saint Brigid of Kildare are Receptive and open. "Blessed are the poor in spirit, for theirs is the kingdom of heaven. "An inner attitude of receptivity and openness.” Thomas Merton once wrote, "at the center point of our being is a point of nothingness which is untouched by sin and illusion, a point of pure truth, a point of spark which belongs entirely to God." Reader 4: Saint (your name) and Saint ( ) are Vulnerable and flowing. "Blessed are those who mourn, for they will be comforted. "Vulnerability and flow. Mourning is a deep form of emptiness. If we can stay open, We discover that a mysterious "something" does indeed reach back to comfort us. Once again, we were invited to journal on these ideas for 15 minutes. Take some time with these Beatitudes the way they are written. Welcome the “Saint” you chose as your companion. Which of the 8 Beatitudes, engages your imagination and heart at this time? Invite your “Saint” to tell you how she/he experienced the challenge of moving beyond limiting belief systems? And how they have acquired clarity? Ask your Saint to companion you in re-membering yourself to how God sees you as a Beloved Saint. 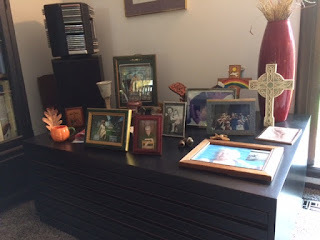 While my retreatants were journaling, I changed the centerpiece to convey; All Souls’ Day. 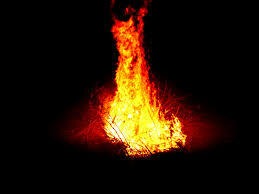 The Fourth Part was to honor, The Feast of All Souls! I invited everyone to share the picture or object they brought to remember their loved one. The Feast of All Souls, The Day of the Dead. Leader 1: We are reading the Gospel of the Transfiguration for this day. As we remembered all Saints Day, we had a peak experience of; realizing ourselves as, already One in The Communion of Saints. But, now we are coming down the mountain. We will find the mask of our false selves again. We will find the mask of the false self on one another again. But this time it is different because we take our memory of ourselves, where we saw ourselves as God sees us with us. We are not alone, because we are deliberately bringing our Saint and this loved one we remember with us. Think of this as you hear the reading. Take a moment to do some prayerful imagining with The Transfiguration Gospel. Place yourself in the position of Peter. Tell, The Transfigured Jesus how wonderful it is to be here with ________________(your loved one’s name), Moses and Elijah. Allow yourself to imagine this scene for a moment. Let yourself hear, “the voice from out of the cloud: "this is my beloved, my own; listen to this one." Write about this idea. While my retreatants were journaling I changed the centerpiece for Eucharist. We used a modified version of our regular worship aide. We closed our Eucharist with the following prayer. After, we enjoyed a delicious potluck supper with great conversation. Closing Prayer and Grace for the Potluck Supper. Have a Blessed All Hallows’ Tide & Thank you! Sacrament of the Sick for JoAnn Wells by Rev. Dr. Barbara Billey, Heart of Compassion International Faith Community, Windsor, Ontario, Canada (Oct 31, 2016). Barbara Billey on right, mother JoAnne holding chalice, seated:Kathy Worotny of our HOC International Faith Community. It’s the day before Halloween. A paramedic is wheeling a man to his bed in the emergency room of our local hospital. The man is wearing orange prison garb, and his legs are bound together by handcuffs. What I see is no aberration, no trick or treat. Neither is the reality that my 80-year old Mom, JoAnn Wells is here, too, having suffered a heart attack a few hours earlier. In April of this year, Mom was diagnosed with Stage 4 breast cancer that has spread to her lungs. 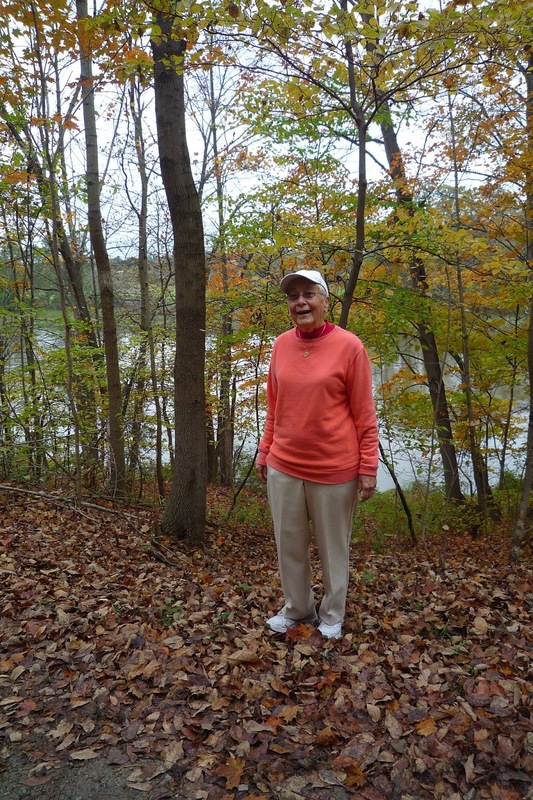 For months, Mom has tapered her usual 3-mile a day walks down to a few minutes, with a stop to catch her breath. She, however, has been unrelenting in sustaining an active social life, her love for people large. Even while Mom’s physical health has been declining, her spirit remains vibrant and her faith in God unwavering. Now it’s Halloween. My Dad, Bob Wells and I stand at Mom’s bedside, where she gladly receives from us the Sacrament of the Sick. 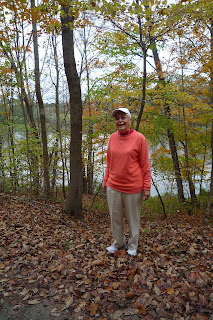 She looks remarkably well for having little sleep in the noisy, blinking emergency room, her rosy cheeks and sparkling blue eyes defying her condition, but that’s Mom – indefatigable even after a heart attack. I read prayers that I created this morning and Dad anoints her. We hold hands while praying the Jesus Prayer and Dad doesn’t let go. protect and give strength to Your beloved daughter, JoAnn. fortify her with steadfast faith in You and in Your son, Jesus. for my heart is faint. Let me dwell in your Heart forever! of those who know your Love and Friendship. in the Unseen Realm of Love. Through this holy anointing (anoint forehead), may God of infinite love and mercy hold you in the grace of the Holy Spirit. (Anoint left hand) May our God of forgiveness, free you from any harm that you may have done; save you and raise you up. (Anoint right hand) May the peace of God, bring wisdom to believe that you have been and will continue to be a compassionate companion of Jesus Christ. Amen. which strengthened Him for his journey of justice and peace. We believe with our whole heart that you are with us now. through this holy anointing, give JoAnn comfort in her suffering. When she is afraid, pour forth Your courage and peace of mind. When hope feels lost, return her to hope in Your present and eternal embrace. And when feeling alone, assure her of the support of family, friends and her faith communities. We ask this through the Risen Christ whose Spirit lives in and with us. May the blessing of our God be with you, JoAnn, now and always. Amen. On the cusp of All Saints’ Day, the experience of anointing Mom leaves us with a peace that passes understanding. In the Gospel of Luke, Jesus is anointed with fragrant, expensive oil by a woman who is deemed by many as a sinner. Jesus forgives her, says she is “A woman who showed great love” and is “The woman of great faith” (Luke 7:47-50). This woman is my Mom. She is all of us. "Pope Francis, God created women and men of equal worth and dignity. How can men say that their call to be priests is authentic, but God's call to women is not? Let's face it, Pope Francis the problem is not with God, but with an all male clerical culture that views women as lesser than men. Sexism, like racism and homophobia is a sin." Popes have been wrong before and teachings have changed throughout history-- slavery is just one example. -endorses sexism and a all male clerical culture. The majority of Catholic theologians do not support the ban on women priests, neither do a growing number of Catholics in Europe, Canada, the United States and South America. Likewise, the world's bishops are not in agreement with this definitive teaching. 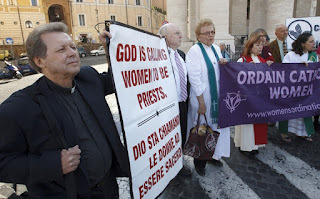 In fact, The Vatican' s own scholars, the Pontifical Biblical Commission concluded in 1976 that there is no valid evidence in scripture to exclude women priests. So, Pope Francis could chart a new path to equality and justice for women including priestly ordination. 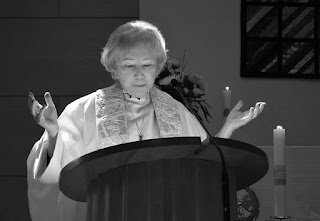 It is time for a conversation about women priests with women priests. We are happy to share our experiences of serving God's people. We are blessed by the courageous witness of Roy Bourgeois and many supporters who have been punished for their solidarity with our movement for justice and equality for women in the Catholic Church. 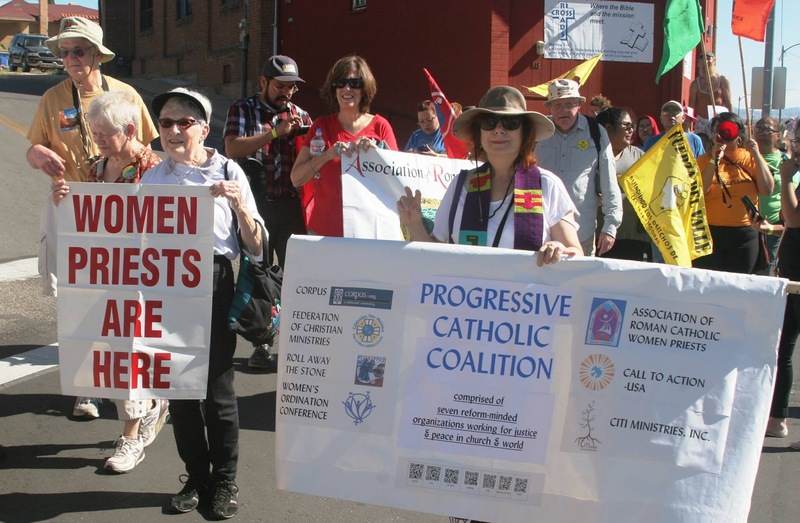 Roman Catholic Women Priests are a prophetic movement changing the church one ordained woman at a time and one inclusive community and ministry at a time. before she too was murdered. Their crime: they were Jews. and they refused to go against the teaching of their religion. in defense of religious liberty for all. Our First, Most Cherished Liberty. never to be forced to act in a manner contrary to our beliefs. not only for ourselves but also for others. We know that we have not always done that. that people of other faiths have to follow our rules. is rampant in countries all over our planet. of bombing incidents in Black churches in the south. even here in holy Toledo. Three years ago the Islamic Center of Greater Toledo was torched. The arsonist said he wanted to “get some payback” for 9/11. were willing to die for what they believed. do not respect the religious freedom of others. on those they saw as perverse and wicked. and the endurance of their hearts. rather than go against their religious beliefs. we need to reflect on the message here. He resists with words of truth. to force Jesus to take sides on the political issues of his time. about the status of levirate marriage in the afterlife. Jesus takes the side of the Pharisees but avoids the trap. “Give to Caesar what is Caesar's and to God what is God's. but ignore the plight of widows and orphans. and whether the issues tend to the needs of the poor. "After Embracing Female Bishop, Pope Spins Again on Women's Ordination"
..."The pope certainly seemed comfortable around Archbishop Jackelen in Sweden, so perhaps the question is this: for a man who talks so much about women being able to do “many things better than men,” as he did on the papal plane today, why can’t he conceive of one of those things being the priesthood? 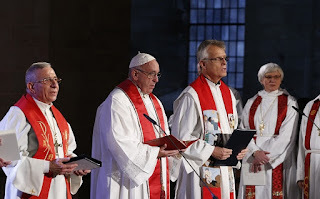 Pope Francis repeated again today his idea of the “feminine dimension” of the Catholic church being represented by Mary, and also said once again that Mary is “more important” to the spirituality of the church than the apostles on Pentecost. What the pope is neglecting to acknowledge, however, is that Pentecost would never have happened if Mary Magdelene hadn’t been the first witness to the resurrection; if early church leaders like Priscilla, Chloe, Lydia and Phoebe hadn’t provided finances and safety to the apostles; if women weren’t the majority of lay people still propping up the church today. The Vatican likes to think that it is built on stone, and any pilgrim walking into Saint Peter’s can look into the depths of its catacombs. 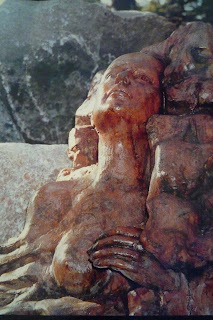 But in those same catacombs are depictions of a woman wearing a dalmatic with her hands in the “orans” position used by priests during consecration at mass. Francis and the church’s continuous denial of this history and the shifts occurring all around them means the Catholic church is not a house of stone, it’s a house of cards. And more denial of women’s vocations will only exacerbate the danger of its total collapse."